Interesting things happen when you try new things and step out of your comfort zone. Last month I did two new things that I thought might help our little design agency grow. I read a book and immediately found an opportunity to apply what I learned. And I attended a new group to try and build relationships in the creative community here in Charlotte. In the last post I mentioned Mike Rohde’s book The Sketchnote Handbook which I picked up at the local library. Much has been written about entrepreneurship and reading but I think it’s not enough to just read. You have to take what you have read and challenge yourself to change your behavior and your thinking. That’s why I immediately looked for an opportunity to try sketchnoting. And sketchnoting helped me with another goal I had when I attended that very first Creative Morning Charlotte event - growing my relationships. I felt that on the day of the event, realistically, I could probably meet and begin to get to know no more than three people. But I wanted a way to extend this opportunity and potential for connections for a longer period of time. I felt like creating and publishing a sketchnote would help me do that. And this act of skectchnoting has helped me do just that. It more than quadrupled the number of people I am getting to know than attending the event itself. And it has provided me a way to give back to that community by acknowledging all of the creativity, talent, energy and hard work, that are brought together on those Friday mornings and making it easy to find and connect with everyone who participated. But two things I didn’t expect also happened. Because of how I shared this first sketchnote on social media Mike Rohde reached out to me and asked me to submit my note for a possible feature on his blog. Then the CM_CLT team DM’d me on Instagram and asked me to consider being the official CM Charlotte note taker in exchange for a standing ticket to all events. All of this from one morning of stepping out of my comfort zone. 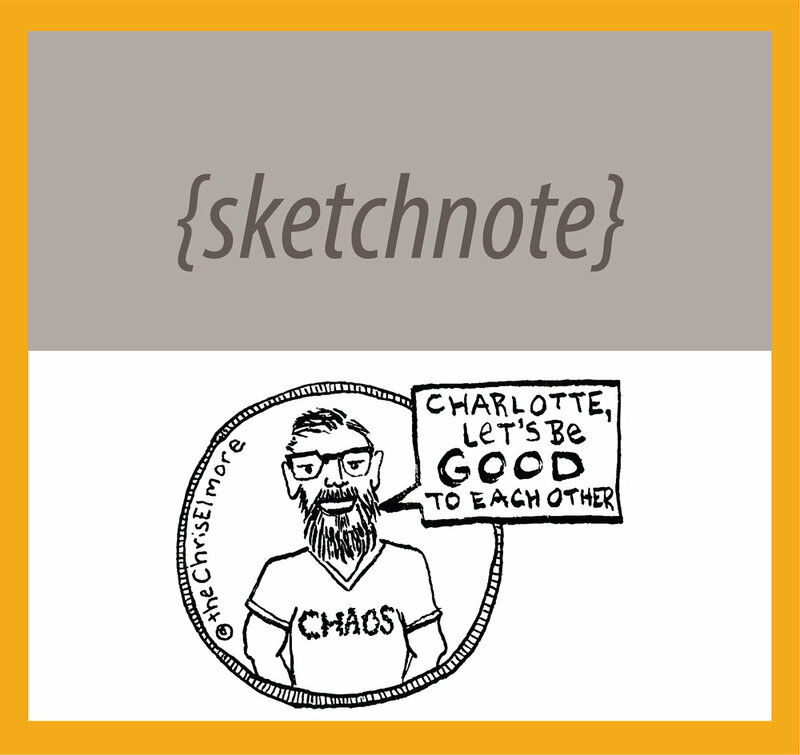 You can click the image above to download your own printable PDF of September’s Creative Mornings Charlotte Sketchnote. I thought about typing up my notes and thoughts about the event for all of you who were not able to attend but that would deprive you all of the opportunity to make connections for yourself. Instead, reach out to one of the participants or head to the Creative Mornings Charlotte website and find someone who attended this event and ask them to share their experience!